Forget 'deflate-gate.' Today is the day for VeggieDag Thursday's obligatory nod to Super Bowl snacking. In 2014, 112.2 million television viewers watched the championship game of the National Football League (despite it being a snoozer of a rout), and they ate while they watched the game. They ate a lot. In fact, only Thanksgiving exceeds Super Bowl Sunday in terms of total food consumption. During the 2013 Super Bowl, here is how much Americans snacked (as compiled by The Street). Yes, six of those seven are technically 'vegan.' 'Pigging out' isn't limited to animal-eaters. New England Patriots (AFC) vs. Seattle Seahawks (NFC). 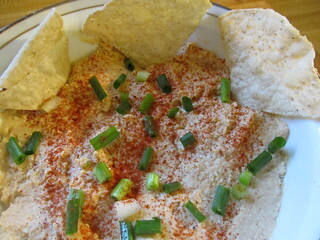 Seventeen snacking recipes (equally valid for occasions other than the Super Bowl). Since this past Sunday was the anniversary of Robbie Burns' birth, why not haggis, but vegetarian, keeping the intestines of free-romping sheep intact. The recipe is basically split peas, oatmeal, pearl barley, and Marmite - that last one, the 'intestines' of yeast, if you will. — Via The Guardian Food. 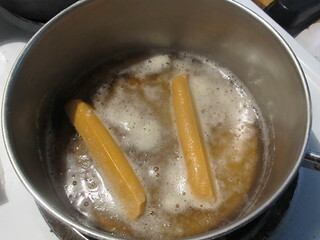 If you must go with 'faux' meat: steam some Field Roast Frankfurters in beer. — Version 1 (grated tempeh patties), via Vegan Dad. 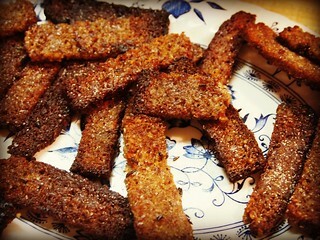 — Version 2 (baked, marinated tempeh rectangles), via Slate. 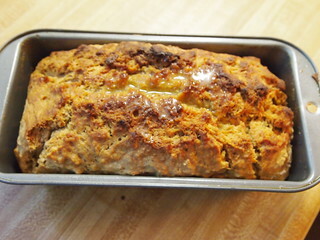 Baked with a chickpea flour batter. Your choice of hot sauce. To be one with those 79 million pounds of avocados. — Via Washington Post Food. For true 'Bavarian'-style pretzels, don't omit the ... lye! A starchy day, but without the grease. 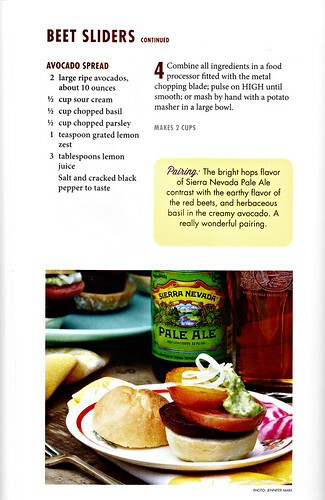 Finally, with permission from the author, here's a recipe for Beet Sliders with Avocado Cream, from the cookbook. Dinner in the Beer Garden, by Lucy Saunders, author of several books on cooking-with-beer. These sliders are inspired by the infamously spicy beet sliders from Gatsby's Diner [unfortunately, now closed], in Sacramento, California. 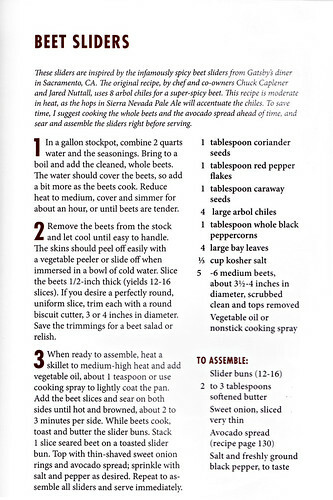 The original recipe, by chef and co-owners Chuck Caplener and Jared Nuttall, uses 8 arbol chiles for a super-spicy beet. 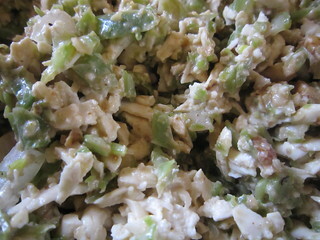 This recipe is moderate in heat, as the hops in Sierra Nevada Pale Ale [Saunders' suggested beer pairing] will accentuate the chiles. To save time, I suggest cooking the whole beets and the avocado spread ahead of time, and sear and assemble the sliders right before serving. Click on the graphics for larger, printable versions. And (not that you might need reminding), don't forget the beer, itself a fine vegetarian foodstuff. The game will feature the American Football Conference champions, the New England Patriots, taking on the winners of National Football Conference, the Seattle Seahawks. So, one wonders, should the beer choices be Boston Beer vs. Anheuser-Busch? * Kristin Capps of The Atlantic takes all of us to task about putting beans in chili (that's stew, not chili, she says), and, by implication, the exclusion of meat. Published on-line by Slate, January 2015: here. 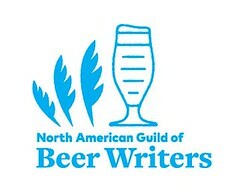 Dinner in the Beer Garden is available for purchase at the webstore of the Master Brewers of the Americas (MBAA). Read YFGF's review: here. Read all the VeggieDag posts: here. Suggestions and submissions from chefs, writers, and home-cooks welcomed! Contact me: here. Pic(k) of the Week: Heavy Seas' kettle door. 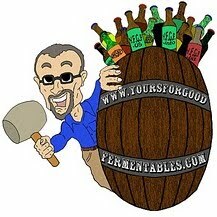 Is Cizauskas shilling for Boston Beer? Drinking, again. Terminal beers, reviewed. Pic(k) of the Year for 2014. Süffigkeit for the new year!